When in Panama City Beach … Go Fish! Florida’s Gulf Coast offers a wonderful variety of saltwater and freshwater fishing opportunities. Go after the elusive Blue Marlin, Yellow Fin Tuna, Amberjack, Cobia Red Snapper or Grouper. One of the largest sport fishing fleets in the country is based in Panama City Beach. The inshore trolling season (just off the beaches) starts in the early spring and continues through the fall into November. Likely catches include Cobia, Spanish Mackerel, King Mackerel and Biting Big. May to October, the inshore waters also bring in Bonito, Jack Crevalle and Mahi. 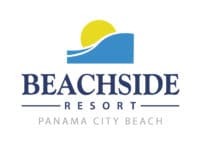 The Panama City Beach area offers quick access to deep water fishing in the Gulf of Mexico where you are likely to hook Sailfish, Spearfish, Marlins, Yellowfin Tuna and Wahoo. St. Andrews Bay and surrounding bayous offer further diversity to the already wide array of local fishing opportunities. Try casting your rod for some Trout. Think you’re a true fisherman? Go truly local and try cast net fishing for mullet or flounder. Here’s our list of several top-notch marinas in Panama City Beach that host annual fishing tournaments and offer fishing charters, excursions and boat rentals. 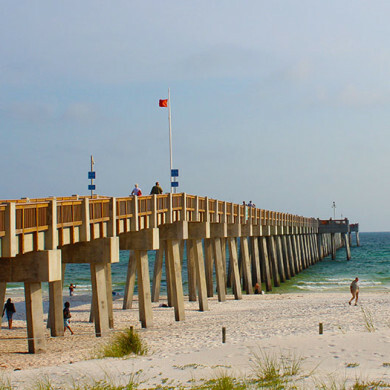 Fun and economical fishing opportunities can be found on the Russell-Fields Pier, aka the County Pier. It is a great place to view marine life such as dolphins, manatees, rays and sharks. Tucked away on Grand Lagoon, Bay Point Marina offers fishing charters and pontoon rentals. This charter company offers saltwater and freshwater light tackle fishing, with a focus of small parties of 2 to 4 on a 26′ Shamrock or 1 to 2 anglers on an 18′ Actioncraft. At this popular marina, you can book deep sea fishing excursions, tours to Shell Island and private charter boat trips. You can also watch fish delivered fresh off the boat to Capt. Anderson’s Restaurant, a local favorite. A Capt. Hank Charter is all-inclusive, providing all the gear you need, plus a restroom, lounge and 6 bunks. The captain himself has been in business 45 years. Several charters launch from the docks of Lighthouse Marina, for fishing excursions or a swashbuckling adventure aboard the Sea Dragon Pirate Cruise. A private marina, Pirate’s Cove is home to the Paradise Adventures Sailing Catamaran, offering sunset and dolphin cruises, as well as adventure tours. You’ll find party boats, dive boats, sailing, snorkeling, pontoon rentals and dolphin cruises at this treasure of a marina. Enjoy the beautiful waters of Panama City Beach!